If you’re completely at a loss when I say ‘Core Aesthetics’, I encourage you to check out this video, and feel free to check out the first time I wrote about the concept. In a sentence, core aesthetics are categories of engagement that define what a player experiences and thus why he or she plays a specific game. There is arguably a pretty short (we use nine) and comprehensive list that covers most (if not all) games. If that sounds heavy but interesting, again, go check out the other links, which still only scratch the surface. Without further ado, the Core Aesthetics, Pokémon-style. I believe a strong case can be made that each of these aesthetics is core to Pokémon, depending on how you play the game. The design of the game (and in some cases the product and services around the product) actively encourage each of these aesthetics to allow the player the opportunity to emphasise whatever appeals to him or her most. In each case I will try to briefly capture why I feel the aesthetic is or could be core to playing Pokemon. The Pokémon games ask ‘What if the world were filled with these fantastical creatures, and people had a cooperative relationship with them?’, and ‘What if you were an up-and-coming trainer in such a world, aiming to be the champion?’ The games thrust the player into this role, and then lets him or her walk the many steps in that journey. Unlike many JRPGs, the game places the player in a role where they have to give instructions (a trainer), which reinforces the fantasy since that is in fact what the player does while playing: select instructions from a menu. Compare this with games where the player is the epic hero slashing through monsters, by choosing options from a menu – it doesn’t foster the same feeling of ‘being’ the role. With each iteration of the game, the settings become more vibrant and alive, with more activities for the player to participate in. The game is so convincing in its fantasy that I often have conversations with friends who feel it is a design flaw that they must play this role of ‘trainer aiming to be champ’ and take on the Pokémon Gyms, rather than choosing some other path. While I think such a change requires great care in implementing, I am mostly impressed that the fantasy is so well built that being ‘someone else’ in this world seems like an obvious extension of the game, rather than a crazy abstraction that would be unrealistic in concept. Can you win a battle against a team of top-notch pokémon, all of one type? Can you beat this gauntlet of trainers one after another? Can you navigate this maze? How about capture this legendary pokémon with only one chance? Battle with only three pokémon of a set level against infinite opponents? Pokémon sets up its rules, then it consistently gives the player new and different hurdles to overcome within those rules. It may be a highly forgiving game (note the difference between Challenge and difficulty), but it still throws challenge after challenge at the player. With the advent of Sky and Horde battling in Pokémon X/Y, there are two new obstacles to consider: can you win with only flying pokemon, or in a one-against-many battle? While it is straightforward to play through a Pokémon game without ever once interacting with another soul, there is a great deal of community encouragement within and around the product. Just look at the basic product: a game that comes in two different versions requiring trading between them if a player wants to complete his or her collection. Over the years, this has expanded from trading with friends to trading with anyone around the globe. Once upon a time it required a link cable, then a wireless adapter, and now it’s as simple as having a wireless internet connection. Moreover, there are now online community activities outside of the game with in-game benefits: the Global Link. And it all started with the simple ability to trade pokémon with a friend. Social games, from achievements to facebook games to MMORPGs, have become a vast field of study in game design. However, as seen with Pokémon, designing the option for interaction directly into a game that would otherwise be a single-player experience can be a powerful force. Just as trading was built into the original Pokémon, so too was battling. Equally, over time it has expanded a vast community, all the way up to organised tournaments with prizes for winners. There are even communities of players who virtually emulate the game in order to circumvent all other aspects of the gameplay. Many aspects of Pokémon design play into this, but I’d like to highlight one in particular. Every opponent the player faces in the game plays by the same rules that the player does. Every Pokémon encountered can be sought out, caught and trained if so desired. This means that from the very foundation, Pokémon could be a competitive game without any additional design work, since the combat is primarily symmetrical. This of course doesn’t mean it would be interesting and balanced – that has taken many iterations for the developers to fine tune – but it does mean competition did not need to be tacked on after the fact. With each new game comes a new area to explore, new pokemon with new moves, and all new emergent strategies from among all the new-ness. Even in remakes like HeartGold SoulSilver, so much has changed over time that there is the joy of discovering how things have changed within previously explored areas, in previously fought battles, and with previously known pokemon. There is, put simply, a lot of content and a great deal of depth to the interactions within that content. The most powerful tool any game has at its disposal to allow the player to enjoy expression is choice, and Pokémon has many layers of choices. At the most basic level, Pokémon allows expression in minute detail through the many choices which go into making a team of pokemon: which pokemon do you use, how do you raise them, what moves, equipment, variations or combinations you use. Pokémon Black and White 2 added medals, which you earn through the hundreds of in-game activities (the Pokémon version of achievements). The player can attach one such medal to his or her player card, showing the world which personal achievement he or she likes most. Starting with Pokemon X/Y, the player also gets to choose how the character looks and what he or she wears. Even more than this, the game covers a wide variety of aesthetics with its activities (the topic of this entire post! ), which in turn allows the player to express themselves through the choice of activity. Do you attend tournaments? Do you master the battle tower? Do you catch them all? Do you breed? Do you explore the world? Do you ‘just’ beat the game? Do you compete in non-combat contests? The choice is completely up to the player, and thus an opportunity for a great deal of personal expression is born. I think I have spent something like a collective 2000 hours on Pokémon games. In my mind, that’s not a badge I wear with pride (though I’m not ashamed of it): it’s an achievement unlocked for the developers of the game. Between catching, training, breeding, or whatever else takes your fancy, there are many ways to just relax and spend time in a Pokémon game. Straightforward, comfortable mechanics which allow the player to make progress towards a goal simply by putting in the time really enable this. Moreover, if the game world is rich enough to capture the player’s imagination, and you give them outlets for just passing some time productively in the game, then it can reinforce that feeling of being a part of a fantasy world. For those keeping count, I’ve got two aesthetics left. While I don’t think there is much of an argument that they are core aesthetics to Pokémon, here too there is clear design work from which we can learn. In Pokémon, sensation is far from a core aesthetic. The graphics and music consistently improve but they are hardly of the awe-inspiring variety that you see in, say, a Final Fantasy game. Having said that, this changes more and more as the series progresses, especially with the upcoming Pokémon X/Y (with an upgrade to full 3D). By changing the visual perspective from the typical top-down, and an impressive modern soundtrack with variety to match the locations of the Pokémon world, the game is certainly more of a spectacle to play with each iteration. Here’s one example that has stuck with me. 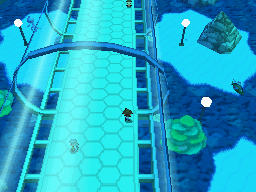 There is an underwater tunnel (Marine Tube) in Pokémon Black and White 2 where the walls are glass and the perspective is behind you instead of just above, the music was inspiringly aquatic and equal parts friendly and mysterious, almost alien. I still turn on my game and go to that tunnel just to watch the fish and listen to the music, even though there is pretty much zero functional value to the place. In addition, the battle perspective has been updated from previous generations, and there are new interactions where you may play with your Pokémon on the touch screen (tactile interactions ahoy – no, I don’t mean the naughty kind, you’re twisted). All of these features and this work on the sensations of the game sweetens up the overall package. Sometimes, appealing to aesthetics that are not the core of the game, as long as it’s not at the expense of the core aesthetics, can lead to more accessible games. I’ll be brief: I don’t really think there is a ‘story’ to the Pokémon games. I don’t mean the story is bad, it’s just not there. There is minor development of a ‘rival’, and a few key figures pushing along the action of the game, but this only has the barest beginnings of characters developing and interacting. The most recent Pokémon games have provided a larger cast of significant characters with their own motivations and development, so perhaps even more is in store for Pokémon X/Y. Mind you, this isn’t a bad thing. I think the narrative is intentionally minimalist to appeal to a wide audience. After all, how many stories do you know that appeal to both seven-year olds and 30-year olds? It’s interesting to note here that just as including a breadth of aesthetics can produce wide appeal, so too can knowing when to not throw an aesthetic in haphazardly. So what can be learned as a designer from all of this? Honestly, a ton, more than I can extract in a brief summary. This is just one small scratch on the surface of what can be gained from looking at games through the lens of aesthetics. Do I expect to make the next Pokémon or Minecraft: the games that appeal to most aesthetics imaginable in enough measure to attract wide success? No, but we can begin to understand these successes through the lens of core aesthetics, designing around or towards these aesthetics, and ultimately make better games for it. And what about Pokemon X/Y? As the series continues and I find myself more drawn into the world, I discover that rather than any kind of drastic change, I look forward to seeing how Pokémon broadens its horizons, appealing to even more aesthetics. In this iteration, there is supposed to be a focus on ‘beauty’, so I’m looking forward to more attention to personal expression and a variety of appeals to my senses. Maybe soon I’ll be able to call Sensation a contender for core aesthetics as well! There’s so much discussion to be had here. Do you know any other games that you think call many aesthetics ‘Core’? Do you agree with my overall assessment of Pokémon? What do you take away from all this? Don’t forget to pop over to Playing with Aesthetics and weigh in with how you personally rate the different Pokémon aesthetics. Don’t be too swayed by my words (persuasive though I am) – vote for the aesthetics that are core for you when playing Pokémon! Oh man, I strongly disagree. I think if you look back at that Extra Credits episode, you’ll see that a game generally has one, or two, or maybe three core aesthetics. This is way too many core aesthetics for pokemon. There’s nothing wrong with a game with just one core aesthetic. I would not expect a Pokemon game to include anything but discovery as a core aesthetic, and I might hope that it offers expression and challenge as well. Saying that a game has fellowship as a core aesthetic because it’s franchise is communal is also really odd to me. Keep in mind that I’m not saying that the average person plays the game for each of these core aesthetics – I expect most players to tap into 1-3 of them. However, as Extra Creditz argues in that same episode with Minecraft, I think some rare flexible games appeal to many different people in different ways by giving them access to many core aesthetics. For example, you were strongly against the idea of Fantasy in Pokemon, but it’s one of my primary reasons for playing the game. I’m not really into the power fantasy thing, but a world where I can use hard work, effort, creativity and some personal cunning to definitely contribute, make progress, and be part of something bigger? That’s attractive to me, that’s a game of make-believe I love. Cooperation and synergy with other creatures, a cap on the level of violence (even in a game where the main mechanic is still combat), living in such a world are all core reasons I am attracted to Pokemon as a game. I think there’s a great discussion to be had around how much interaction must be contained purely in ‘the game’ in order to qualify for something like fellowship or competition as a core aesthetic. The social aspects of Pokemon are clearly designed for, and even supported in a trans-media sense with organised play and online community activities with in-game benefits. If a decent chunk of players play primarily in competitions to prove themselves, does that make Competition a core aesthetic of Pokemon, or is it somehow disqualified because it is organised outside of the ‘main game’. Honestly, I don’t know the answer, but I’d be willing to bet there are plenty of people who play Pokemon with the core aesthetic of sharing it with other people, or beating other people at it. Just thought I would throw my 2 cents in here. I like the conversation as a whole above but thought I would add a blip on fellowship because in our grid, I was more the one pushing it to begin with. But first off, I want to mention that there are 2 ways to really go about this grading exercise. One, where we try to capture what the game designers were going for and one where we emphasize how we interacted with the game. Ultimately we are doing more for the latter. The first one is a bit of a crap shoot. It assumes that the designers actually conceptualized these aesthetics (a hefty assumption seeing as the paper wasn’t written until 3.5 generations of pokemon were out), and assumes we can get in their mind. Additionally, it will always have our biases either way. So the second method seems more relevant. We are just presenting our own experiences with the aesthetics. The hope being that with people voting in mass you get a nice aggregate number of how people truly interacted with the game which maybe comes close to mimicking what the designers designed for but if not is an equally (perhaps more) relevant concept of what the game represents (kinda back to the age old argument for books about the difference of what an author meant versus what people take away from it). Okay, back to my thoughts on fellowship. To me, fellowship is all about the community. Somewhat touching on Dust’s point, I honestly do not think you can wholly separate the game from the community in some (many?) cases, and Pokemon is one of those cases. The game pioneered the concept of community in gaming. There has always been the pokemon community. When JRPGs were in a world of isolation, Pokemon asked, and in someways forced, players to collaborate. With four pokemon that evolved on trade and others that could only be received by people with the parallel game, they made gamers look up from their gameboys and look to their fellow gamer to answer the call Pokemon: “Gotta catch em all”. It brought people to their local video game stores and trading card stores to meet and play these solo games as a community. And so much more has blossomed from that; there are competitions, conventions, fandom galore. And mechanics within the game have gone a long way in emphasizing these aspects with each passing game. New methods to interact with everyone around the world. Legendary giveaways if you meet up at your local stores. The whole game just breeds community. Ultimately, have I interacted with this aesthetic THAT much in the pokemon games I played? No, not wholly. I remember doing the trades here or there with Dust growing up and sometimes going to my friend’s house to just play through the game together a bit and trade when we got the opportunity. But the fact that the element of community exists greatly affected my mindset around the game. In my articles about how the internet has impacted gaming for better/worse, I talk about how it’s hard to feel like I am having my own personal journey in RPGs because there is so much information out there telling me that people out there used the same strategies or took the same path. It’s all been done before. But to me, the elements of Fantasy, Expression and Fellowship all come together to halt this feeling at the pass in Pokemon. From the outset, you understand that you are part of this broader community of trainers trying to explore this world and make it to the top (game fantasy). This is buttressed by the community that is such a prevailing force. The need to trade, the fandom the conventions… there are other trainers out there (Fellowship!). All of this comes together with the vast array of choice in Pokemon. What Pokemon do I choose and why? Are they cute, do I like the element combination, do they fill a strategic gap? What moveset do I go for? Do I bother EV and IV training? All of this leads to such deep levels of expression that you can feel like no one has treaded the path you are walking down. There is more to say I think, but I don’t want to go on forever. To end I guess I just want to throw out one more instance of how people create and experience their own personal journey. People that live for the Nuzlocke challenge are all about ramping up challenge… limiting resources by limiting the expression and discovery aspects of the game. If this is the core of how someone experiences the game, their ideas will clearly be different from a tournament player who maybe has seen more of the game through a Mod of the game that allows them to easily toy around with full IV full EV, any skill Pokemon. They must see the game from a much more competition side. They can tell you when IVs and EVs are needed in speed to be faster then a key weakness in common tournament play, or what attack is needed to autokill an enemy that you don’t want living to see a second turn. Sorry for the late reply! We really appreciate token of recognition! We did a Liebster a while back so I’m not sure if we want to go through all the motions again. We will at least give you a shout out and try to try to answer your questions when we get a moment! Don’t worry about it lol. If you get a chance to answer them give me a wee shout.